The playbook for senior living marketers has changed dramatically over the last 10 years. With consumer activity shifting to a digital world, where do traditional marketing activities like PR fit in? And, how can digital supplement those traditional tactics? On this episode of the Senior Care Growth Show, Janis Ehlers, President, The Ehlers Group, shares her advice on how to leverage traditional methods like PR in a digital world to increase census in your communities. Winston: Welcome to this episode of the Senior Care Growth show. My name is Winston and today we’re going to be talking about a really interesting topic, combining traditional senior living PR tactics with modern digital tactics to improve your census. And I’m super excited today to be joined by Janis Ehlers. She is the president of the Ehlers Group in Fort Lauderdale, Florida. They are a marketing communications agency for senior living communities all across the country. Janis, welcome to the Senior Care Growth show and maybe by way of introduction you can tell people a little bit about who you are and what it is that you do. Janis: Sure. Thank you so much for inviting us today. Public Relations is something that I really enjoy and I have such a passion for. It’s so funny because no matter how many times we get a client’s name in an article in the newspaper and I sort of pat myself on the back, you know, Janis, you can still do this and it brings so much pleasure to me. My company is over 20+ years old and I created the group after I had a very strong corporate background as well as experience at a public relations firm and my company sort of merged that. Early on, I wrote a book called ‘Marketing Senior Housing’ and decided that my future was really in the senior housing industry-that I couldn’t be something to everybody. So we’ve specialized in senior living communities and we work from the west coast of the country, Arizona, Washington state, Oregon, California and to this coast in Florida. Winston: Yeah, it’s amazing. What a cool industry to be in. We’re having so much fun talking to folks in the industry and learning so much about the industry and just a really good place to be. Janis: I sure think so. You had mentioned to me how has public relations and marketing shifted over the past 10 years, and I think about it really as a consumer because I broke my ankle last October and I was homebound and running my business through the Internet and telephone. I could keep the business going and that really wasn’t a problem. I was able to eat because I could order a meal delivery to the house that was coming every day. I could get everything from paper towels to pet food online and Amazon kept me shopping. So, I think that’s really the key and how things have changed for consumers and it affects public relations because the news has changed. How we get our news is so dramatically different today. You see the shrinking newspaper every morning when I go out to my doorstep and pick up the newspaper, but you see the growth in things like podcast, the value of blogs and all the things that are digital that the consumer now has access to, including digital editions of the newspaper. So they’re still getting the news, but they’re just getting it different ways and people play into it. Winston: Yeah, absolutely. And so that’s a good segue into a question I had for you, newspapers are shrinking and people are getting their news in different ways, what types of PR activities do you think are still relevant today and where should people be spending their time and energy when it comes to PR? Janis: Sure. There’s still traditional public relations and we will contact the newspaper or write press releases. We always say we have a nose for news. For example, this is an article that is about a lady who found a lost dog in their senior living community and lo and behold they heard, we heard about it and we were able to turn that into a very positive news PR story about this woman and the community. So, that’s the traditional PR that still works because people will pick up the newspaper or go to a digital edition of the newspaper. So that’s traditional. Also, newsletters. People still go to their mailbox and they still read what comes in the mail. So, that’s still traditional. We’re constantly looking at traditional PR tools because we know that the end user moving to the community is our audience, but also their adult child and the adult daughter. Also, there’s grandchildren and they’re getting their news and we’re reaching them with PR differently. Winston: Yeah, it sounds like in some cases, many generations of decision makers, you really have to account for how those people consume content and where they get their news and how they would come across these communities. Is that right? Janis: Exactly. And we have to differentiate at one community from another. So in PR we say who are the audiences, what is the brand, what are really the key differentiations of that community that we’re going to get out there both with traditional and this whole advent of nontraditional and new tactics. Winston: And so when it comes to those key differentiators, how do you help communities figure that out? One discussion I had recently with somebody was sort of the ‘sea of sameness’ in a lot of communities doing the same thing or sort of looking the same from a surface level. How do you help them figure out how, what their differentiators are? Winston: To that point, with that much competition, you’ve got to stand out, you’ve got to look different or you’re just going to get lost in the shuffle. Janis: Well, and then you’re also competing against brand new communities that have all the bells and whistles and we have clients that are in communities are 50 plus years old. So, that’s a challenge too. Winston: That’s an interesting challenge too. So what would you say if someone’s listening to the podcast and they’re working in a community that’s been around for a while and maybe the grounds and the actual structure of the building is a little bit dated compared to the new community down the street? What are the types of things that you would leverage in that situation to tell a really positive story and put a positive spin on it? Janis: From a PR perspective, we would go in and say what are the things that separate that community, maybe they have long-term employees that have been there? We have a community where they have multi-generations of families that have lived there and we did a press release about that. That was very unique that mom and dad loved this community so much that their son and daughter moved in there and now their grandchildren in their seventies are considering moving in. That’s really significant. That’s really saying that people believe in that community’s concept. In some ways the older community gives you more to work with from a PR perspective than a brand new community because it sort of has roots. Winston: That’s a good point. So, if you go through that audit and that assessment and you determine with the community, here are a few things that make you different, here are some value propositions that are unique to your community that we really want to leverage and promote and get the message out there, what are some of those traditional PR methods that you would use to do that? And then how do you think that those work together with some of the more kind of modern digital methods? Janis: Well, we start with the press kit, we have press releases that we develop and we also have what we call media pitches. And then we leveraged those things. When you get an article in the newspaper, we help a community either with reprints and we just don’t let that press release sit there. We figure out how we can maximize that. It could be through reprints, posted on the web, sent out to people, used as handout in the sales office, even if it doesn’t appear in the newspaper, there’s still value in that press release. So that’s one thing. Then we blend it together with new social media that allows us to control the story we’re telling. So that could be content, strong Facebook post blogs that are posted on the city’s website on a regular basis or video used on Facebook. Those are the things we’re really working with communities now that we’re controlling the news that’s going out. You cannot go to your local newspaper and hope for a story every month-that would be a perfect world. We’re lucky to get a story in the newspaper maybe once every four months, every six months. As a PR firm, we have to justify our existence because at the end of the day somebody’s going to say, why am I paying for a Public Relations Company? All that social media that we can move the information out there is just so much more powerful. Also, the media and newspaper reporters are also following those posts. And they may see something that we’ve put on a blog, it hits their hot button and now it turns into something that they’re interested in. Winston: That’s great. I like those ideas. You mentioned the press kits, press releases and media pitches, what are some newsworthy things that communities could pitch to the media or would warrant a press release? Janis: Thank you for asking. For example, here’s a community, it’s 50 some odd years old. We found out at Christmas time at the ‘Luncheon for the Lonely’. We found that at Christmas time, residents get together and they have a luncheon for people that don’t have family in the area. So we pitched that to the newspaper. The newspaper loved it. And in addition, we also provided recipes they were serving because every year, they serve the same recipe at their traditional luncheon. Who would think that you could get PR and make the front page of the local section with something like that. Another example was a community that was celebrating national holidays. There was a national senior health and fitness day and this community didn’t have anything special planned. And so we suggested, this big day is coming up, can the community do something special? And the activity director said, “Well, I’m taking the group of residents to a local park for this new type of therapy.”I think it was tree-hugging therapy. It’s an activity where they go and commune with nature. Well, what do we have here? We have a national holiday, we have people going external, showing that seniors are going to a local park. So, we had all the good things that make a good pitch and the paper loved it. The park also loved it because they said, “oh my gosh, we didn’t think about promoting our part this way.” It goes back to what I said, we have a nose for news and if you put me in a community, frankly you could put me in a lot of places, I will find things that are worth promoting that somebody would enjoy reading about in tomorrow’s newspaper. We will get a call from our clients often and they’ll say, “Janice, we never residence celebrating their 100th birthday. We want the media to come here.” Well we have to step back and we have to say, okay, we’re really happy that, Mrs. so and so has had this longevity. But what’s the hook? What’s the angle? What’s going to make somebody when they pick up the paper, when they turn on the news tonight, what’s going to make that special? So we turn it around and say, what did she do in her life that we can have a hook to promote? Sometimes there’s not, sometimes she’s a lovely lady and she’s had a rich life, but then other times you find out she was a school teacher and over the years she taught thousands of people and lo and behold, somebody became a US senator. Well, that gives me a little bit more to work with, so it wouldn’t be necessarily people that are 100 years old jumping out of planes or doing something, but we try to find that hook that somebody’s going to be interested in reading about it in the paper tomorrow. Winston: Those are such cool examples. As I was thinking about stuff, I was tracking with the events and we’re doing fun stuff in the community. But, some of those ideas are so unique where like you said, the person who’s celebrating 100 birthday find out what about their life and what’s the angle that makes that really newsworthy and interesting. That could make for really captivating story. I can totally see it as a news outlet. That’s a cool human interest story. How neat is that? Janis: Well, last week we had a client that has an Olympics every summertime they call them the ‘Summer Olympics’ and we put out a media alert and they really do pretty much the same thing summer, but they’ve done it for 15 years and we put a pitch out and I really was holding my breath. I really didn’t think they’d come out again this year and sure enough they came out again this year. They love it, but you know, it’s August, the west coast of Florida and there’s not a lot going on at the end of the summer, so the Olympics brought them out again. Winston: That’s great. I think the cool thing about that type of coverage is that it just shows the personality of the community in such a way. It’s coming from the news, from a newspaper or an outlet that’s not the community itself saying, let me tell you and let me show you. But it’s someone else saying, this place is really cool with all this fun stuff they’re doing. Janis: And they say, supposedly an article in the newspaper has a 70 percent greater retention rate than an ad. Now, I can’t compare it anymore to what the retention rate other ways in which somebody is reading about something. But that’s pretty significant. We’ve had people say they’ve gone into their doctors office and somebody in the office will say, “Oh, Mrs. So and so I read about you in the paper”, and that could have been six months ago, but they remember that. And so, people remember that and when they started thinking about that senior living community, those are the things that are going to probably drive that person to make the phone call. Winston: And so much in these podcasts we’ve talked about the decision making process of the prospect who is looking at these various communities. And it makes total sense, but it comes back to trust. And which community do they feel the most trust with and which one do they feel like they can trust the staff and the people. What better way to build trust than through a sort of a public story of something really interesting that they’re doing or some fun activity that is super transparent, it shows what’s happening. I think that that just makes total sense. Yeah, that’s awesome. Janis: It’s very important for senior living communities to differentiate themselves through events. And another really important point to make is the value of PR and that it is tied to crisis communication. People have crisis plans on what they’re going to do operationally in the case of a crisis or an emergency situation. But, often those crisis plans don’t take into effect how they’re going to communicate to their families and the external community. We’re in Florida, so we’re very cognizant of hurricane season and last last year this really came into play and we really learned the value of PR, the value of the Internet and Facebook because we could help our communities get that word out there twice a day with broadcasts. The families were turning to the Internet for that link as opposed to just telephone calls from the community. Winston: Yeah, that’s a good point. We talked about the positive sides of PR, but then when you have something negative happen at the community or something with negative implications that’s outside of the control, like a natural disaster, having someone who can help craft the right message out that’s public facing is just so important that can really have a huge impact on the direction of the community and whether or not they’re successful long-term because it can be so damaging if not handled the right way. Janis: Exactly. Also, coming from south Florida, we’re very concerned about school safety. We also have to be very concerned about the community’s safety and thinking in terms of crisis -it’s also another podcast Winston, but when you think about a crisis, it’s not a question of if it’s a question of when, and that philosophy can really help in thinking about how we’re going to communicate our messages. So that’s my pitch for crisis. Winston: They really should be a whole other podcast I think where we help communities with how to handle certain crisis situations and almost help them think through a toolkit of sorts. I think that would be really cool. Janis: We will go back to the people that commune with nature instead. Winston: Yeah, exactly. We’ll keep chasing the tree hugging stories, I love that example. That’s so good. Well, Janis, you’ve given us so much good advice on how to find really positive stories in these communities and how to get the word out there. This is one of those things to me that seems like there’s just a ton of benefit, but it also seems like something where you really have to have that kind of creative mindset and be able to pick out the angle that’s right. You also have to be careful about it. Like we said, the message that you’re communicating to the outside world has to be really carefully crafted. All that being said, if someone’s listening to this show and they think, we really need to do more from a PR perspective, what would be your advice and next steps? Janis: Well, I think it’s really important, particularly in the use of social media that we always say you have to keep frequency and you have to think about who is going to be responsible to maintain that frequency of the message. And, not that I want to pitch my company, but there are people out there that specialize and the advantage is at the end of the day when you outsource or you designate somebody that that is really their responsibility, at the end of the day, that’s what they have to do. And so often in a senior living community, it’s delegated to an activity director, a marketing person, the executive director, and you want that activity director to be a very creative activity director doing activities or the marketing person giving great leases and closing deals and they weren’t hired to be writers that understand how to craft a marketing message. And to the point of the 100-year-old, we see in a community, one community will say, “Happy birthday Betty” or “Happy 100th birthday, Betty”, whereas a PR person will spin it to say “The community celebrates Betty’s 100th milestone.” We look for ways that we can celebrate these momentous occasions with our residents. So that’s the difference of the person that’s untrained doing it versus the person that’s a trained expert. We also have seen situations where somebody will say, don’t worry about that, we’ll have one of our residents write that. But, a resident can get their feelings hurt if their words are edited or if they’re criticized. So by outsourcing it, you can really make sure you’re putting your best foot forward. And in a medium that is very, very powerful. So I think it’s worthwhile exploring outsourcing or having a trained professional on your team that does that. Winston: Yeah, I would totally agree. Janis: It really isn’t that expensive. People think that it is, but it really isn’t. Winston: Yeah. And, I think the downside of not having someone who is a professional do it, the risk that’s involved with having an untrained person be your public facing communications person, it’s extraordinarily high. Janis: Right, exactly. We know how damaging, negative Facebook posts can be. So, why not really assure your community that you’re putting your best face out there. Winston: Yeah, absolutely. Well, Janis, thank you so, so much for being on the podcast. I really appreciate it. Janis: Thank you. I’ve enjoyed it. Winston:Yeah. Awesome. 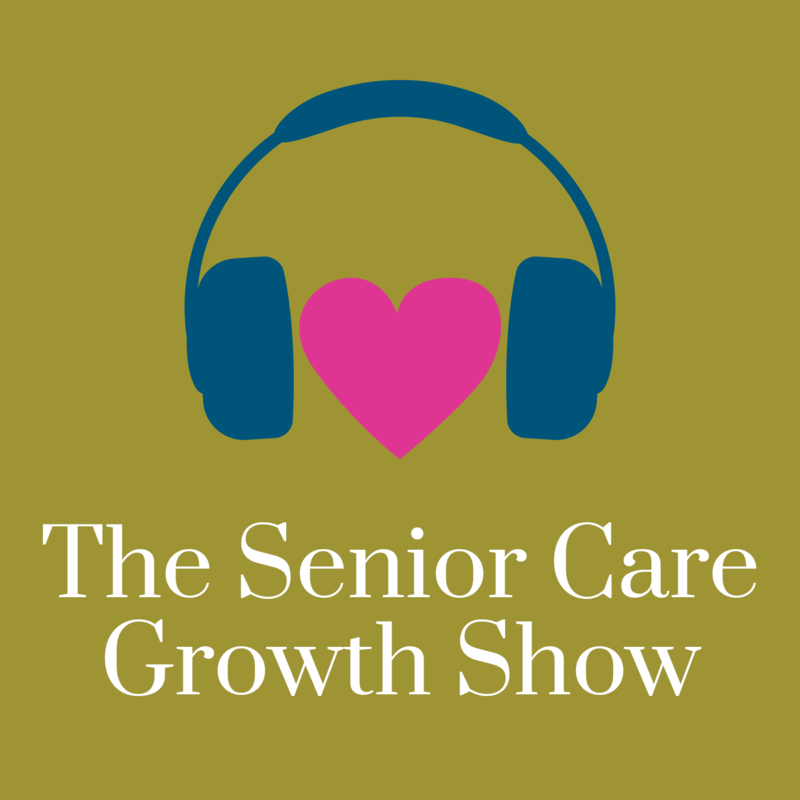 And so you’ve been listening to the Senior Care Growth Show. My guest today was Janis Ehlers and thank you so much for tuning in. We’ll be back with another episode in a couple of weeks. Thank you for listening to Senior Care Growth Show where senior care sales and marketing professionals come to grow. We’ll see you next time.